There is an ever increasing number of levels within the automation industry, particularly in the area of networking. The information transmitted within the different levels of a system can be illustrated by the automation pyramid – and in industrial production, the boundaries of each plane can become quite blurred. In the traditional production line, the various connected devices can be controlled via 5 different network systems. For each level, there are several techniques that have been developed for data transmission and processing – each is equipped with different connectors and cabling systems. In addition to hard wiring, for signal transmission RJ45 and M8 and M12 plug connector systems are employed. For power requirements, M12, 7 / 8 “, M16, M23 and different rectangular connector systems are commonly used. The industry is currently seeing great strides in development to accommodate safety technology within the Fieldbus and Ethernet networks. Molex supports these developments with products developed specifically for Ethernet, Ethernet IP, Profinet and CIP Safety. In the same way that wireless connectivity has changed the way people communicate in their business and personal lives, it is also revolutionising how plant automation networks operate. While adoption has been slow, more networks are using wireless Ethernet protocols to add new devices, extend the networks into hazardous locations, and establish connectivity with devices and systems that may be in motion, such as robotic cells and material handling systems. Part of this trend is driven by the cost imperative of connections in a plant. 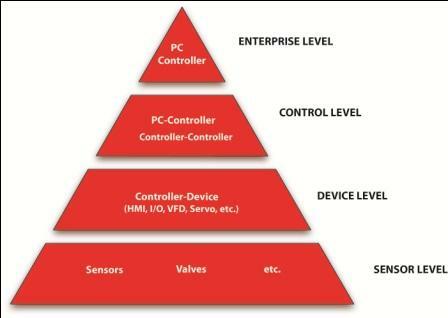 If you consider the “connection pyramid” diagram it is clear that the biggest installed cost savings of wireless occurs when you get to the edge or end devices on a network. In addition, more networks are implementing wireless Ethernet protocols to add new devices predominantly to save on installation costs, but also to increase system flexibility and enable mobile communication – this is only possible if no additional power supply is needed. 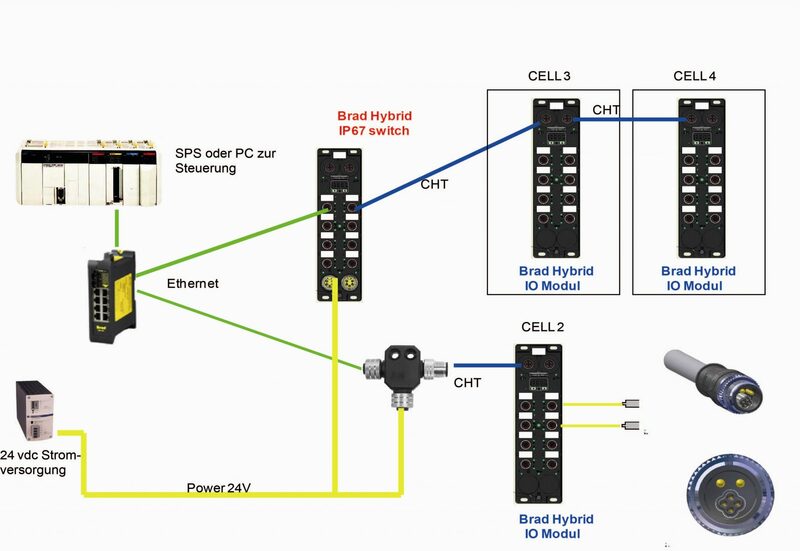 When an additional power supply and a high transmission rate are required simultaneously, the emerging trend is to replace the multitude of different signal and power cabling with a hybrid solution. 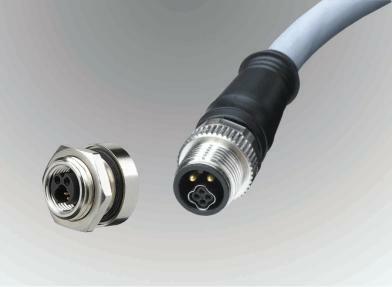 In a hybrid solution, the different wires for signal and power are harnessed together and connected with a hybrid connector. Drawing on many years of experience with hybrid technology, Molex has already implemented hybrid solutions in a variety of different systems. Ethernet applications, for which the traditional RJ45 plugs and sockets have been used for many years, have progressed though to Cat5E and Cat6A, and now onto Power over Ethernet (PoE). Today, the transmission of both data at 10 Gigabit Ethernet rates and 30W per port power to networked devices over a standard Ethernet is possible. In office applications, such as network routers, telephones, and webcams, PoE technology has been used successfully for many years. PoE components are already being used within the network with up to 16 ports for data transmission. The industry initially used plug-in modules to replace the wiring to create a more flexible and faster solution, while ensuring better security. With increasing use of industrial networks (such as Profibus and Profinet) distribution boxes with trunk and branch lines are now being used. 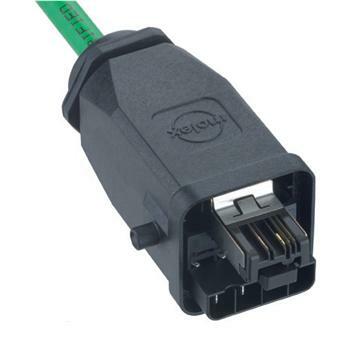 RJ45 plug-in systems that were previously used exclusively for the indoor office environment have been adapted for industrial use by adding a round or rectangular housing. At the same time, hybrid solutions have also been developed, which can additionally be offered in a power harness. These solutions are costly, however, and are increasingly being replaced by the much more robust and reliable M12 system, which achieves a much more compact design. The M12-series hybrid CHT (Circular Hybrid Technology) from Molex can accommodate in a standard M12 format 2 shielded signal contact pairs and an additional 2 or 4 power supply contacts. 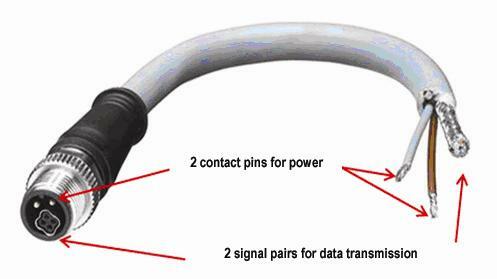 For Cat5E lines this allows up to 100 MHz signal transmission and is capable of carrying up to 10A with 2 power contacts, and 6A with 4 power contacts. Thus it is possible with only one line, to provide surveillance cameras, encoders and sensors for automation components, even in very harsh environments. At the same time, progress is being made to extend the IP67-protected industrial distribution boxes with M12-hybrid systems. Outside of industrial applications, M12-hybrid plug-in systems are increasingly used in applications in automotive, commercial vehicle and shipbuilding, as well as in the mining and off-shore industries. A more recent example of hybrid technology being used comes out of the lighting industry. Last year a European city installed new Christmas lights – besides design and urban redevelopment, special emphasis was placed on economics and sustainability. 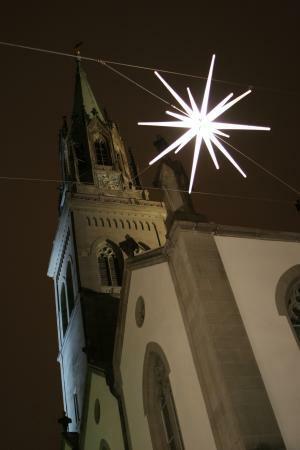 The lighting project used numerous stars; each emitting 14 rays of light and using 14 LEDs. The 9,800 star-rays are controlled individually from a central unit and illuminated with a warm-white light. The signals from the central unit are transmitted through the DMX/ACN Intranet Protocol on sub-distribution, where they are converted into an EtherCAT signal and transmitted through additional distribution boxes to the stars. The entire lighting system has about 1000 EtherCAT nodes. For example, video signals can be transmitted, which can then be generated on the star’s rays as monochrome video images. To string the stars along the old city streets, carrying cables were required and, to avoid having 2 different cables to supply the data and power, an M12-hybrid plug-in system was implemented using the Molex CHT 4+2 connector. In addition to aesthetic benefits (i.e. fewer cables on the streets), the hybrid plug-in system realised significant cost and time savings – since half as many cables were needed in comparison to a conventional system. The fixed wall-mounted distribution boxes contain hybrid devices, which are screw fixed onto the corresponding hybrid cable connectors. This allows for quick assembly / disassembly of lights and a compact, moisture-proof connection, which can be used reliably for many years.